The hotel is housed in an elegant eighteenth-century building and was renovated in 2009. To the right is Richmond Terrace, where the magnificent view across the Thames valley has for centuries been an inspiration for poets and painters. To the left are 2,500 acres of Richmond Royal Park, home to herds of red and fallow deer. With a total of 68 guest rooms on offer, the air-conditioned hotel welcomes guests in a lobby with 24-hour reception and check-out service and lift access. 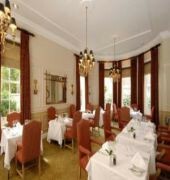 There is restaurant on site, and the conference facilities and WLAN Internet access may be of use to business guests. Room and laundry services are additionally provided, and those arriving by car may leave their vehicle in the complimentary car park. The Richmond Gate Hotel is a Tourist hotel. Located in City Centre area. Shopping is within walking distance and the nightlife/restaurants are located in the hotel. 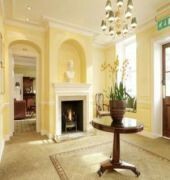 Descriptionclass="small" style="text-align: justify; font-size:11px;">The hotel is housed in an elegant eighteenth-century building and was renovated in 2009. To the right is Richmond Terrace, where the magnificent view across the Thames valley has for centuries been an inspiration for poets and painters. To the left are 2,500 acres of Richmond Royal Park, home to herds of red and fallow deer. With a total of 68 guest rooms on offer, the air-conditioned hotel welcomes guests in a lobby with 24-hour reception and check-out service and lift access. There is restaurant on site, and the conference facilities and WLAN Internet access may be of use to business guests. Room and laundry services are additionally provided, and those arriving by car may leave their vehicle in the complimentary car park. What a Rare Gem! Wish we could have stayed longer! My husband and I were looking for a quiet spot to restore before heading into London. This place has just what the doctor ordered - a place to decompress after a long flight across the pond. The gym was surprisingly well equipped. The pool was one of the better lap pools we have ever experienced in our international travels. On top of that was their amazing restaurant called The Gate. The service was excellent and the food was a cut above. They were able to accommodate the menu to fit our needs. Everyone was from top notch! Your kind feedback is most welcome. Thank you for taking the time and I do hope we get the opportunity to welcome you back in the not too distant future. I came for lunch with a friend. The decor is beautiful, all gorgeously curated clashing patterns and lots of light. I had the kale tagliatelle, which sounds pretentious but was just great fresh pasta, with kale, pesto and almonds. Thereâ€™s also a great DJ curating some brilliant chill out tunes that ramp up as the day goes on. All round great and Iâ€™d recommend it. Iâ€™ve stayed at a couple of other Harbour hotels and really liked them. Iâ€™ve stayed at this hotel many times in the past and was therefore excited to find out it was becoming a harbour hotel. I booked a two night stay. Whilst I was lucky to be in a refurbed room I think the hotel needs to be clearer on booking that you may not be so lucky. I certainly was not aware the re branding was not yet finished. Anyway, I was given room 6 which was a lovely spacious room on the ground floor. It wasnâ€™t without its downsides though. Sound insulation is not great so any noise from reception is easily heard in room 6 and the same goes for any noise in the car park (eg a group getting into taxis at 6am). There are also floodlights outside the hotel which the very pretty shutters cannot block out completely. Other minor complaints were that my safe didnâ€™t work and the mirror was rather grubby. Bottled water would be nice. I ate in the gate restaurant one night and the service and food were good. Public areas of the hotel that have been refurbed look lovely, but the walk to the spa is rather dingy and depressing and lands you fully clothed right next to the swimming pool. Itâ€™s then a bit of a trek to get to reception and then the changing room. 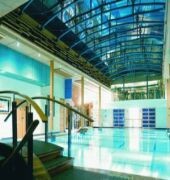 Disappointed they had got rid of the jacuzzi in favour of an exercise studio, but the spa was as big as some of the others in the portfolio so canâ€™t really complain. So, overall not too bad, will be lovely when itâ€™s done but I will wait a while before going back to make sure all the work is done. Thank you for you constructive feedback as we bring our refurbishment to a close and attend to such occurrences as you have mentioned. I'm also happy to announce that our Jacuzzi and hydro pools are back in stock as of the end of this week and our secret relaxation garden is going to be a popular addition. This 4 star hotel certainly has wow factor in both the room and bar/dining departments. I would highly recommend it from both a comfort point of view and quality/service. I was being a bit fussy in prep for an important date but nobody found my requests too much - in fact the bar/restaurant manager (Innes, lovely lady) made sure everything was special for us. The food was absolutely delicious, service faultless and the unexpected wow finally was the comfort of our bed. Better than my own! We do hope to welcome you back at the Harbour soon. Richmond Harbour Hotel was previously The Richmond Gate Hotel. Restaurant, Bar and Reception areas have all been updated and are fabulous! 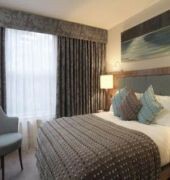 The rooms are in the process of being upgraded however they are still very comfortable. 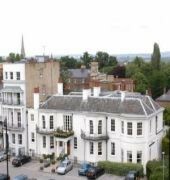 Location is right at the top of Richmond Hill and a 5-10 minute walk from the amazing bars and restaurants within Richmond. Staff are amazing, very friendly and make you feel really welcome. I will be sure to pass on your compliments to our staff. Such positive feedback is always well received. We have just launched our new spring menu and I do hope you have the chance to give it a go.